Dominic Leiva at the school spelling bee. In today’s world, most people know someone with a diagnosis of autism, considering one in 59 children are identified on the autism spectrum. Here is a story of one unique child from Fayette County, and how he is teaching us about what all children can do with patience, endless support and thinking outside of the box. Dominic Leiva, the son of Geovanny and Heather Leiva, is a fifth-grader at Bell-Aire school in Washington Court House. Dominic was diagnosed with autism at 2-and-a-half-years-old. He had all the typical signs of autism; no verbal communication, rigid interests, he was not making social connections, and engaged in self-stimulating activities to regulate his central nervous system. Once the diagnosis became official, Dominic started in several interventions, including speech therapy. His mother recalls many discouraging appointments. The therapist could not get Dominic to talk, or even use sign language. They tried for six months on the sign for “more” without any success. This frustration continued for many years. He received specialized school therapy and outpatient therapy without making many communication gains. His family came to the realization that Dominic may never communicate his thoughts and feelings through words. His second-grade year, his teacher recommended Dominic try a communication device. He had an IPAD for many years, however he did not view the IPAD as a means of communication. Dominic and his family went through the rigorous journey to qualify him for a communication device. He finally was given a device called The Accent 1000 with Lamp words for Life, from the Prentke Romich Company out of Wooster, Ohio. Unfortunately, even though Dominic now had this amazing communication device, his other struggles related to his autism took his focus off communication. He was not able to sit still and was having very difficult spells of self-injury. The device was only being used after the teachers would prompt him numerous times, and even then, he was only using it for food icons. His third-grade individual service plan (IEP) at school showed Dominic was not able to achieve preschool or kindergarten level academic goals. Of course, this was more difficult news for his family to process. By the end of fourth grade, Dominic began a new medication which seemed to help him control his body a little more, resulting in better focus and participation in tasks. His school staff noticed he was using the device to give short, routine sentences using the icons to ask for food, toys, etc. This was a really big improvement! Dominic was barely acknowledging the device and now was able to put some sentences together. The improvement did not stop there. What we are continually learning as a community, professionals, family members and friends is to never underestimate what any child can do, especially children with extra challenges. All these years, Dominic has been understanding the world around him, retaining information but not able to share it effectively because his body wouldn’t cooperate, and he did not have a consistent mode of communication. 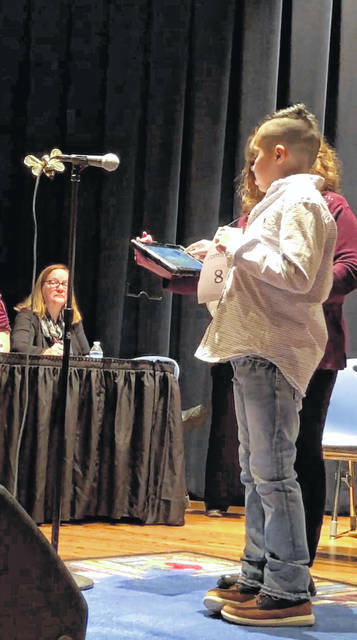 https://www.recordherald.com/wp-content/uploads/sites/27/2019/02/web1_Dominic-Leiva-at-school-spelling-bee.jpgDominic Leiva at the school spelling bee.